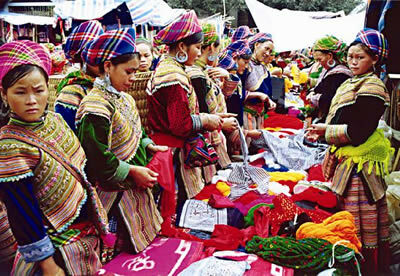 - The Can Cau Market is another special market near Bac Ha.Although smaller than Bac Ha, is one of the most colourful market of the northwest highlands. 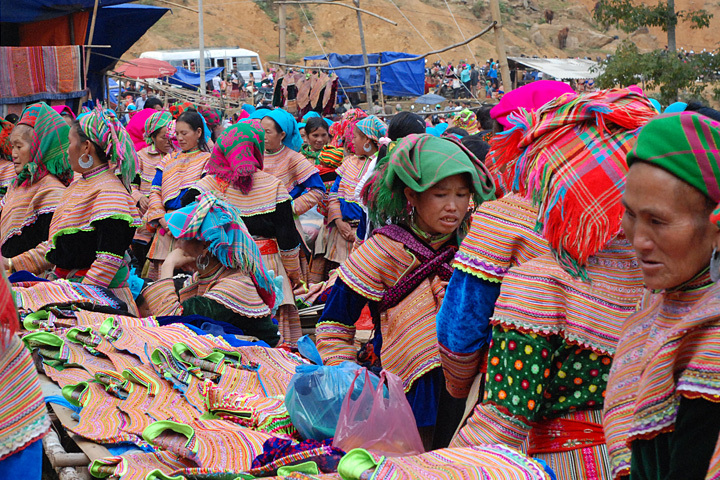 This market is only open on Saturdays and is a great option for those not able to visit the Sunday Bac Ha Market or wanting to have a more intimate market experience. - BacHa is the biggest market in Sapa a the Sundaynd open on Sunday only. 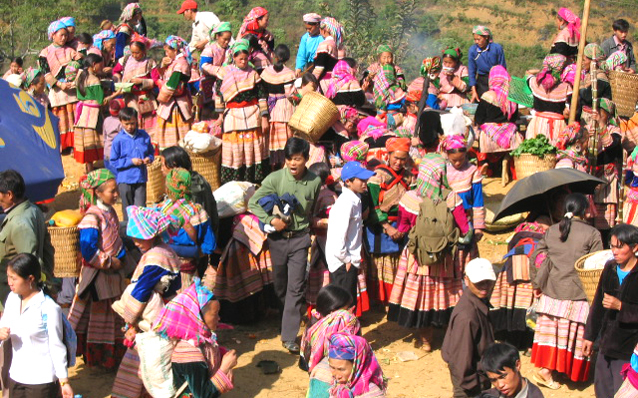 The Sunday market in Bac Ha is where you'll want to stock up on water buffalo, pigs and horses. After breakfast, we start the trip to the South East of Sapa alongside Muong Hoa valley to Y Linh Ho village, trek 2 km down to Lao Chai village, take picture of paddle field and visit minority house and school. The lovely walk that will take us along small paths and trails and through several hill tribe villages of Lao Chai and Tavan, home to H'mong, and Dzay people. This is a absolutely spectacular walk through stunning scenery inhabited by some of the friendliest people you can meet. Stopping for a lunch on the way at a family in Ta Van village. Opportunity to meet with local people and study the art of making batik and local weaving villages - study textile tradition of craft women o Black H'mong and Red Dzao. Transfer back to Sapa town for overnight at hotel. 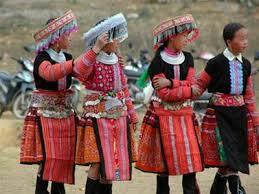 Start early in the morning at 06:00am, driving to Can Cau market, which passing Bac Ha Town. The road between Bac Ha and Can Cau is hilly but very beautiful. The products at the market are interesting, and many different groups of ethic minority people represent make the market an unforgettable experience. Back to Bac Ha for lunch. Check-in at a hotel in Bac Ha. After a rest, trekking about 5 km of mountain path to Ban Pho Village - home of Flower H'Mong people, get in touch and witness their traditional life style, habit and customs. Overnight at hotel in Bac Ha. After breakfast, take a trip to Bacha. The beginning of the day on which you visit a big market filled with many different hill-tribe peoples. This is the most colourful market in North Vietnam. At the market, you have chance to enjoy BacHa people's simple but unique kinds of food with special wines made from rice, cassavas, corn and different sorts of fruits such as plumps, apples, peaches... talking to the minorities through the guide's interpretation. Leave the market for the H'mong King's house (King Hoang A Tuong) built by the French colonists and the Chinese in 1920. Return the town for lunch. In the afternoon, spend time visiting another village (BanPho village) Say good bye to BacHa and get back to Lao cai for night train back to Hanoi. The guide sees you off at Lao Cai train station and takes you on the train. Overnight on train. Overnight on the train. Arrive in Hanoi early morning next day, around 05:00AM, please take a taxi to your hotel. End of tour.